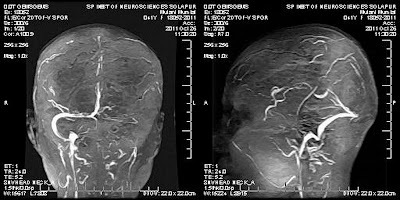 Axial flair images of brain show abnormal high signal in the region of superior sagittal and left transverse sigmoid sinus with loss of normal T2 flow voids, corresponding portion of dural venous sinuses show no flow related signal on non contrast 2D TOF MR Venogram implies to thrombosis. T1 bright signal of the thrombus attributed to Meth Hb – a sub acute stage blood degradation product implies to sub acute stage thrombosis. 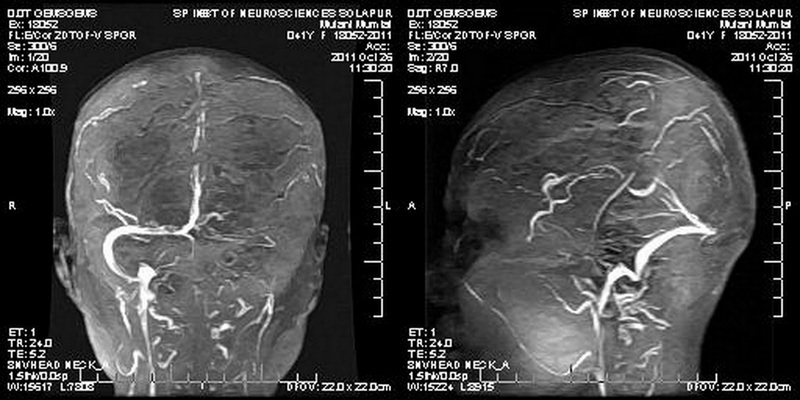 Impression: Thrombosed superior sagittal and left transverse sigmoid sinus - sub acute stage thrombosis.